Put this Leopard fabric chair in the office or family room and create a happy spot to relax. 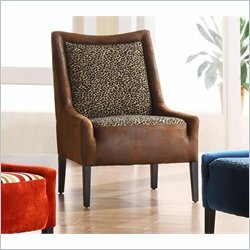 This animal print club chair is a combination of leopard print fabric with wrangler faux leather. Specifications:Overall Dimensions: 36 H x 26 W x 29 D Weight: 35 lbs.